You Can Now Watch the First Episode of Jordan Peele’s Twilight Zone for Free“The Comedian” stars Kumail Nanjiani and Tracy Morgan. The Twilight Zone Recap: Who’s Laughing Now?We are now re-entering The Twilight Zone, alongside Kumail Nanjiani as a stand-up comedian who makes a Faustian bargain for laughs. The Twilight Zone Recap: In-Flight EntertainmentThe new Twilight Zone takes an old Twilight Zone classic and moves it 10,000 feet higher, and in a decidedly different direction. How The Twilight Zone Re-created a Timeless Opening Title Sequence for 2019The producers and composers behind the new revival break down how narration, imagery, and music was used to both honor and update an iconic opening. Why The Twilight Zone Revival Isn’t Black-and-WhiteThey didn’t want to make “a karaoke version of the original,” says executive producer Simon Kinberg. Seth Rogen Is the Latest Actor to Journey Into The Twilight ZoneSomeone should post a sign or something. The Twilight Zone Trailer: Jordan Peele’s Series Runneth Over With MysteriesThat Jacob Tremblay is up to no good. Adam Scott Will Have a Nightmare at 30,000 Feet in the Twilight Zone RebootThere’s something on the wing! 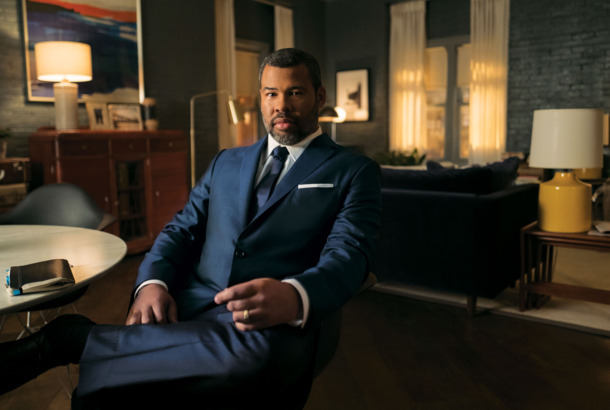 Jordan Peele Will Enter Another Dimension, Host CBS’s Twilight Zone RevivalComing in 2019. CBS Is Developing New Twilight Zone Series for All Access With Jordan PeeleAll Access is doubling down on its iconic sci-fi programming. Who Is the Sexiest Shakespeare? An InvestigationIs Joseph Fiennes in Shakespeare in Love the hottest Bard? CBS Twilight Zone Reboot Will Be Interactive Choose your own scream-venture. James Sheldon, Who Directed 1,000 Episodes of TV, Dies at 95He worked on over 100 shows and an estimated 1,000 episodes in virtually every genre. The 11 Scariest TV Shows Ever (and Where to Stream Them)Don’t watch Ghostwatch alone. The Looper Effect: More Time-Travel Movies On the WayGlimmer, Almanac, My Name Is Adam, The Twilight Zone. Seitz Asks: What’s the Scariest Episode of The Twilight Zone?Our TV critic votes for the one with the weird masks. We Come to Bury the Fourth of July TV MarathonStreaming video has killed this wonderful holiday tradition. Seitz Asks: What’s the Most Underrated Show of the Eighties?In this week’s column, our TV critic makes a case for the eighties remake of The Twilight Zone. Sherlock Holmes Writer Tony Peckham Enters The Twilight ZoneHe’ll join a stacked team — Cloverfield’s Matt Reeves will direct, Leonardo DiCaprio will produce. How Hollywood Could Make Five Other Twilight Zone Tales Into Happy-Ending BlockbustersThey did it with ‘Real Steel.’ Why not turn “Nightmare at 20,000 Feet” into a Ryan Reynolds action flick? Syfy Swaps Out Twilight Zone for The Greatest American Hero, and the Geeks RevoltShut-in sci-fi purists will have to find a new way to spend their Fourth of July. Michael Jackson Rehearsal Footage: The MoviePlus: Finally, Padma Lakshmi gets a sitcom. Harold and Kumar Are Hungry AgainPlus, news about Emma Thompson, RoboCop, and Elizabeth Berkley in our daily trades roundup.